Dimitrios Psaltis, University of Arizona in Tucson, EHT project scientist, said"The size and shape of the shadow matches the precise predictions of Einstein’s general theory of relativity, increasing our confidence in this century-old theory. 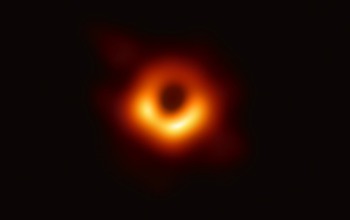 Imaging a black hole is just the beginning of our effort to develop new tools that will enable us to interpret the massively complex data that nature gives us." Tony Beasley, director of NSF's National Radio Astronomy Observatory, said "Through its leadership in ALMA and long-term support for the EHT, NRAO has once again helped to advance our understanding of the cosmos and the fundamental laws physics. This observation clearly illustrates the value of radio astronomy to scientific advancement. The next generation of radio telescopes, including the Next Generation VLA, will yield many more groundbreaking results." Hmmm Well it's black but that's all. Looks magnetic to me. Not gravity - probably a Birkeland current. Need a better picture than this one. I don't believe that there are black holes. This looks like one great big plasma engine. One large electrical and magnetic event. These people really want to find a black hole and so that's what they see. I see a large Birkeland current.